This is the first in our series of interviews with various members of the team at Barrington Pools. We’ve had a chance to talk with many of our customers recently and one of the things that you’ve told us is that you would like to know more about the “people behind the pools”. With that being said, let’s meet Edward Gearen who has a great perspective on helping our customers build pools since he has experience in the field as well as back at the office. How long have you been with Barrington Pools? This will be my 6th year at Barrington Pools. Though it is my second year of doing Design & Sales. Previously I worked in the field doing service on pools. In the construction warehouse. And as a customer service representative for the southern pools. My favorite project was one I designed last year in Lisle, Illinois. It has everything! And it wasn’t easy. Working under tight lot coverage rules I was able to work with the clients to design a pool that was the size they wanted and features they were looking for. And they made some sacrifices to gain additional pool square footage. It has 24” raised spa that has an infinity type cascading edge waterfall feature with glass tile that flows into the pool. Stone coping. And very minimal paver decking. There was already an existing patio on the house side so the design flows along with that and joins it nicely. The pool is a freeform 20’ x 53’ and a little over 1,000 Square feet. It has a 100 SF tanning ledge finished in stone and 3 LED Bubblers on the tanning ledge. It has 4 LED Laminar jets, Basketball hoop, and a Volleyball Set. It is definitly the place to be on a nice summer day. They chose an awesome PebbleTec color for the pool and spa, Tropical Breeze, which looks simply stunning. It has the Paramount PCC 2000 In-Floor Automatic Cleaning system. And a Spectralight UV sanitation system. Favorite pool trends for this year? My favorite pool trends if it is right for the customer would have to be firebowls and fire features. They make the design and elements really pop. It can also make you feel like there is no way this pool is near Chicago! I also really love glass tiles, glass tile mosaics, or anything with glass to spruce up the pool interior. Including the Luminous Series from PebbleTec finishes. What does your dream pool look like? My dream pool has lots of nooks and crannys. Grottos, tunnels, benches and barstools throughout. Beach entry zero depth entrance. LED Colored Lighting, bubblers, jets, laminars. Infinity edge spa I find look very amazing. Lots of places to entertain and have your own space as well for kids and adults. A freeform pool with a stone waterfeature with a diverock area incorporated into it. 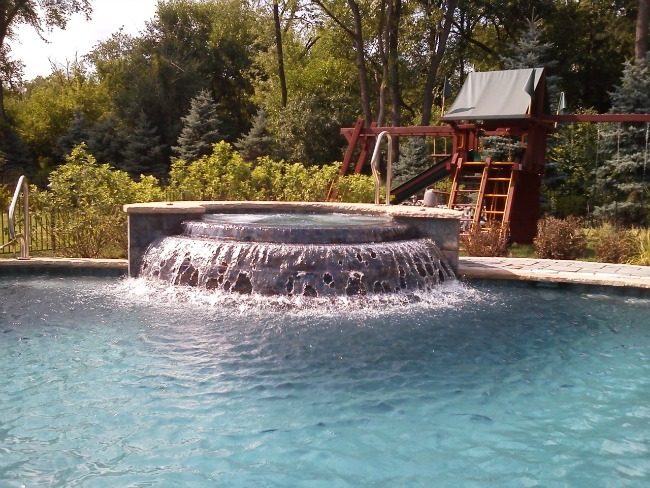 What is the most important question one should ask when considering a new pool? What are my options. Whether that be for size, shape, or location. Or items that you can upgrade. Are you looking for all the latest technology where you are controlling everything from your tablets and smartphones or are you just looking for something basic for the family to cool off in. How the client envisions using there pool is always a good question to ask. What do you do for fun when not at work? I really enjoy movies and TV shows and can spend more time than I though possible watching in a day. I like to go to car shows and racing events, including racing my own car at local events. Playing pick up basketball games.